Eddie’s journey is more conventional than the usual Scorsese hero and so is the film, which goes for grace and style over jittery energy and characters on the verge of combusting. He puts his efforts into the dynamism of the trio of partners (Eddie, Vincent, and Mary Elizabeth Mastrantonio as Carmen) and in celebrating the smoky culture of poolroom society and the snap and crack of a well-played game. 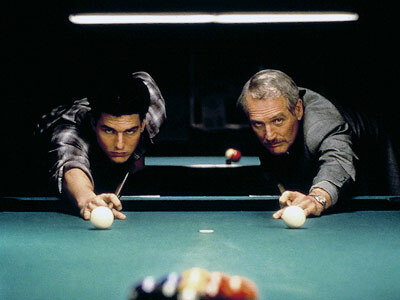 If there is such a thing as pool table choreography, Scorsese has mastered it; his camera glides through long, unbroken sweeps around the table as the players sink their shots one after another. And yet Scorsese’s most accomplished work in the film is the first 15 minutes, from the voice-over intro (Scorsese explaining the rules of nine ball) to Robbie Robertson’s smoky, bluesy theme to the easy confidence of our introduction to the characters and the culture. We hear Newman’s voice but see only money and booze on a bar, the currency of Eddie’s life, in the opening shot. Scorsese takes his time pulling back from the intimacy of the Eddie flirting his way through a sales pitch with Janelle (Helen Shaver) over a bar to take notice of the kid running the table in the background. Eddie’s eyes light up with the charge of possibilities but he plays it cool and cagey, sitting back to observe not just the kid but his girlfriend Carmen (Mastrantonio), clearly the brains of the duo (and most of the ambition), and he plants the seeds of playing the circuit with her. He sets the bait, plays the angles, and lets them come to him. For a man who has been out of the game for decades, Eddie returns with vengeance, seasoned and mature and ready to prove that years of being a student of people will pay off the only way that matters: money. 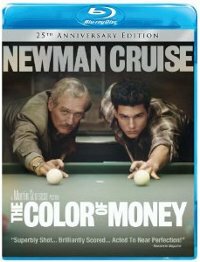 Yet even in the early scenes of The Color of Money, it’s clear that money itself is less a goal than simply a yardstick for measuring success. It’s the game that draws Eddie back, and it’s the game that ultimately is the arena in which he makes his stand. The disc is what DVD Beaver reviewer Gary Tooze calls “thick”; the colors are dark and the shadows tend to fall off into muddiness. Part of that is nature of the production, shot in dim poolrooms and bars and nighttime streets, but it still lacks the sharpness one expects from a Scorsese film. It’s a film that deserves a stronger, richer digital edition. There are no supplements.